Mark Arnold Creations - Fun Ideas Productions! Keep up-to-date on the new projects of Fun Ideas Productions at the Fun Ideas Facebook Group! Check out my new Fun Ideas Book Blog. Just a fun place to get autographed copies of my books! In 1963, Warner Bros. closed down their long-running cartoon facility that had produced such memorable merrymakers as the Looney Tunes and Merrie Melodies cartoons. 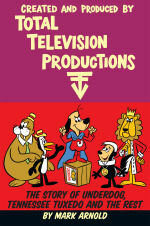 Director/producer Friz Freleng and executive David H. DePatie faced unwanted early retirement. A generous parting gesture from a Warner executive allowed Freleng and DePatie to lease the former Warner cartoons studio on California Street in Burbank, complete with equipment and supplies, for a few dollars each year. They teamed up to create animated cartoons for advertising, but not everything behind their enterprise was enchanting. They struggled to keep their small animation studio running against odds and obstacles such as rising costs, heavy competition, outsourcing of labor to other countries, strikes, death, changing directions, and buyouts. They never anticipated how they would soon style a series of cartoon characters that would paint memorable colors over movie animation history. When director Blake Edwards produced The Pink Panther starring David Niven, Peter Sellers, Robert Wagner, Capucine, and Claudia Cardinale, he envisioned a cartoon character of the same name to illustrate the opening credits sequence. Edwards hired Freleng and DePatie, together with artists at their DePatie-Freleng Enterprises studio, to design the animated sequence. The crafty magenta furry feline minced his way into moviegoerâ€™s hearts. The inspiration behind the ink was the people that worked at the DePatie-Freleng Enterprises (DFE) animation studio. Their hilarious cartoons caused a generation of moviegoers to rock theaters with laughter. Author Mark Arnold returns you to the nostalgic memories of the exhilarating Pink Panther series and other cartoons DFE created. Discover the craftsmen behind the cartoons in an exciting exploration of the Pink Panther, Inspector Clouseau, Ant and the Aardvark, Cat in the Hat, The Grinch, The Lorax, Doctor Dolittle, Spider-Man, Spider-Woman, Mr. Magoo, The Fantastic Four, Planet of the Apes, Doctor Snuggles, Baggy Pants, The Nitwits, The Barkleys, The Houndcats, The Grump, The Super Six, Super President, Spy Shadow, Hoot Kloot, Blue Racer, Crazylegs Crane, Misterjaw, Tijuana Toads, The Dogfather, The Oddball Couple, Charlie the tuna, David DePatie, Friz Freleng, Blake Edwards, Peter Sellers, and various animators. Over 400 photos and illustrations. Available from in Paperback and Hardcover. Now! 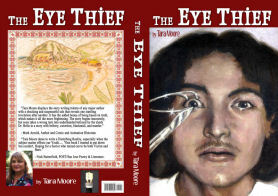 Fun Ideas Productions first novel, The Eye Thief written by Tara Moore. A young man in Mexico, Julian, is financially adopted by an American couple after the death of his father so that he can attend school. Then an eye injury brings Julian into the world of a corrupt doctor. Complications result, including theft, kidnapping, body parts trafficking, and murder. "Frozen in Ice: The Story of Walt Disney Productions, 1966-1985"
When Walt Disney died in 1966, many predicted that it might be the end of Walt Disney Productions, but Walt had a number of ideas and concepts that lasted well into the next decade. He also left behind a well-established group of workers that hoped to continually answer the question, “What would Walt do?” with more magical creations that would dazzle and delight. 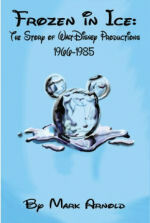 With this book, author and historian Mark Arnold explores the major accomplishments of Walt Disney Productions during the years 1966 – 1985, paying particular attention to their theatrical film output, but also discussing the various new theme park attractions and the TV shows produced during that period. Things went well until the mid-1970s, when ideas started to run thin and repetition set in, causing shrinking box office success. By the 1980s, threats of corporate takeover were knocking at their door, at which time change had become unavoidable if Disney were to survive as an independent company. Paperback also available from Click for current price. "Casper the Friendly Ghost: The Complete Collection (1945)"
Includes two slimline case clamshells; one featuring two theatrical discs and the third disc in its own case features all of the "New Casper Cartoon Show" episodes. The 20-page full-color booklet looks fantastic. Written by Mark Arnold, it is crammed with tons of information including where every episode appears in comic books, when applicable. "Mark Arnold Picks on the Beatles" Available Now! 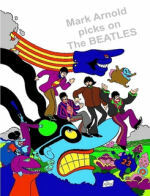 Mark Arnold Picks On The Beatles is a song-by-song review by Comic Book and Animation Historian Mark Arnold of literally every song The Beatles ever recorded, both group and solo, released and unreleased. The book features previously unpublished artwork by Bill Morrison (The Simpsons), who also drew the front cover, Jack Kirby (in a drawing presented by Kirby to Paul McCartney back in the 1970s), Patrick Owsley (Classic Media licensee artist) and many, many others. "If You're Cracked You're Happy!" A remarkable and amusing retrospective of Cracked magazine, the best-selling humor magazine in the world . . . if you don't count Mad! The secret origins of the magazine, covering its history with former and future Mad and Marvel Comics contributors John Severin, Jack Davis, Don Martin, Bill Elder, Jack Kirby, Steve Ditko, and Al Jaffee, along with Cracked veterans Bill Ward, Don Orehek, George Gladir. Cracked was responsible for launching the careers of award-winning alternative cartoonists, including Dan Clowes, Peter Bagge, and Bob Fingerman. Crammed with creator interviews, rare photos and art, and a complete checklist of every issue! A must for comics fans and purveyors of popular media. "Created and Produced by Total Television Productions"
Here at last is the real story of how TTV was formed! Inside you will find rare production artwork and storyboards, as well as reminiscences from TTV's founders. "The Best of The Harveyville Fun Times!" 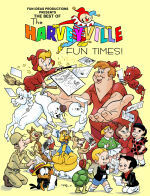 A sampling of the best material from the long-running "Harveyville Fun Times!" fanzine featuring articles about various Harvey Comics characters such as Casper, Richie Rich, Hot Stuff and Sad Sack. Edited by Mark Arnold. 400 pages! Full color covers! Complete Harvey Comics history! Order your copy today! Only $29.95 for paperback or $47.95 for hardback! or contact me at funideas.mark@gmail.com for more information! Minimum rate is $.10 per word. Please contact me with assignment, rate of pay, and deadline requirements. Send email now! Some people will go to extreme lengths to get a job! A wonderful time was had by all! View "The Stories Behind The Stories" interviews with Mark Arnold. Let Fun Ideas be your creative consultant to your print and video production needs. We will do the research, write the articles, create the stories, do the interviews for you. Send email now! to contract Mark Arnold for your next creative project. 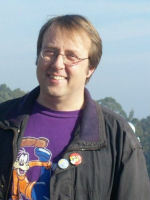 "Mark Arnold is the editor and publisher of THE HARVEYVILLE FUN TIMES, a fanzine which covers Casper, Richie Rich, and other Harvey Comics stars with a winning combination of bemusement and respect. This time out, in addition to the latest issue of the FUN TIMES, he sent a copy of GIANT SHANDA ANIMAL #8 (Shanda Fantasy Arts; $4.99), an anthology of anthropomorphic comics stories. Arnold has the cover and lead spot in this year's ANIMAL with his 50th-anniversary tribute to Richie Rich. "A Treasure Chest of Riches." 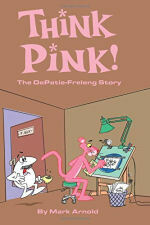 Drawn by Shelley Pleger, the tale pokes gentle fun at the "Willy Wealthy" comic books of olde. Arnold kids because he loves, and his fondness for Richie comes through loud and clear. This is a fine story and I hope we see more of Arnold's comics writing in the years to come." Read "The 'Tools' That Time Forgot". An article by Mark Arnold about a long missing Disney cartoon that appeared in "Hogan's Alley, The Magazine of the Cartoon Arts" no. 14. Read "He's Gr-r-reat, The Thurl Ravenscroft Interview". An interview by Mark Arnold with Thurl Ravenscroft (the voice of "Tony the Tiger", etc.) that appeared in "Hogan's Alley, The Magazine of the Cartoon Arts" no. 14.
for anything other than sending this note to your friend. The latest information on Harvey Comics and Famous Paramount cartoons. Fun Ideas Blog web site.